Removing sand from the Salmon Trout River in Marquette County has helped protect the spawning sites of coaster brook trout, according to researchers. A sand collector was installed upstream last spring to intercept sediment before it reached the endangered trout’s spawning habitat, according to a report from the Department of Natural Resources (DNR) Marquette Fisheries Research Station. The machine pumps sand out of the river, preventing it from covering stream-bottom rocks where the majority of coasters spawn. 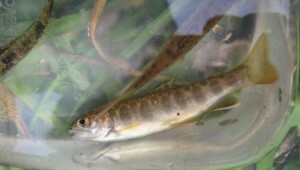 The Salmon Trout River is one of the last Lake Superior tributaries with a natural breeding population of the species, said Casey Huckins, the project leader and professor of biological sciences at Michigan Technological University. “They were once common throughout Lake Superior basin tributaries and nearshore waters, but the populations were wiped out due to over-fishing and habitat degradation,” Huckins said on the project’s fundraising website. Land use and roads in the watershed are the primary causes of erosion, which can lead to excess sand in the river, Huckins added. The DNR funded the installation of the sand collector, but Huckins and his team will need more money to continue their work on the river. They’ve begun a “Save A Spawning Site” online fundraiser, where they hope to raise $10,000 by May 15. Donations would go towards the removal of the sediment that settled downstream before the collector was installed, Huckins said. “Once we have cleared the sand that still covers the spawning site, the collector will be able to keep the site clean on its own, allowing coaster brook trout populations a better chance of recovery,” he said in the posting. Huckins said he hopes the additional sand removal will be possible this summer, and his team will continue to study the collector’s effects by annually assessing coaster numbers in the river. That’s not the only ongoing research to aid coaster reproduction. projects in the Salmon Trout River watershed. In 10 years, its efforts led to a 70 percent increase in the native coaster population, said Carl Lindquist, executive director of the partnership. “We started with a comprehensive inventory of problem sites in that watershed. Then we received funding and developed a management plan,” he said. That plan’s success was featured in the DNR’s 2010 State of the Great Lakes Report, but Lindquist said the partnership’s work is far from over and will continue this summer. The project received nearly $1 million from a number of sources including the Environmental Protection Agency, Michigan Coastal Management Program, U.S. Fish and Wildlife Service and the Great Lakes Commission. 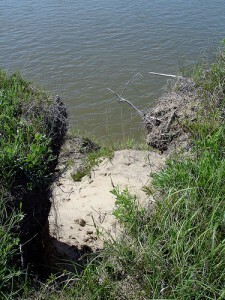 Lindquist explained that the river’s surroundings make it particularly vulnerable to harmful sediment buildup. “The majority of that watershed is surrounded by dirt roads and steep terrain,” he said. “It may not look like a problem during a sunny day, but when it rains, it can hemorrhage tons of sediment. The Salmon Trout River watershed eventually reaches Lake Superior, and sand removal projects help ensure coaster brook trout can spawn and eventually make it to the Great Lake. In the first place…, words to live by. If you want to see a truly horrific tale read the story of N.Y.P.A. They are this evil empire that stopped the all essential ice movement on the Lower Great Lakes. They did it for their own comfort and greed. They did not care one iota about anyone or anything else. They did it in a land of very stupid people that had no idea about how nature worked. They just trusted everything the N.Y.P.A. king told them. One day a shiny fisherman came along and said the King has no clothes and is a liar. Eventually he went on to write “Ice Boom Theory” and tried to warn all of the idiot fisherman, politicians and local “scientists”. They ignored “The World’s Smartest Fisherman” (see YouTube) because the N.Y.P.A King had paid them all measley bribes to sell out their honor and communities. Some got rich while others suffered. This is how we do it here. At least for another 50 years. The End. If the Huron Mountain Club were more accommodating to the rest of us I could get behind this project, but I understand that they are trying to stop people from entering the river from the bridge right before their entrance. If this is the case, and easier access to the river is not granted, I say stop spending money on this projects. Spend it on other rivers that coasters use. Personally, I’d rather donate to a solution that would prevent the sand from getting in the river in the first place. But, preventing problems from happening in the first place, rather than band-aiding the symptoms, is not the American Way!